Twenty-one-year-old Dominic Kallas is not your typical venture capitalist. The Westminster College student spends 20-30 hours a week sourcing and researching possible deals at an $18 million venture fund run almost entirely by students. University Venture Fund, where Kallas works, is a venture capital firm based in the heart of downtown Salt Lake City, Utah. The fund lets college students source and put together deals for possible startup investments. Two guiding partners help mentor and advise the 16 students currently in the program. There are a couple of venture funds throughout the country with a student component. Romulus Capital was founded by an undergrad from MIT. Penn State MBA students partake in the venture-capital process with a $5 million fund that started in 1999. There’s also a social impact investing fund operating out of the University of Michigan. That one started in 2009 with about $500,000 to work with. In the past decade, UVF has made 24 investments, many of which have panned out. The fund has had eight successful exits, including four companies that have gone public. Omniture and Domo founder Josh James says it was the only Utah fund he took money from for his then-fledgling company. “No other Utah investment firm got in that round. My brother was there and I invited the University Venture Fund to create an opportunity and an experience for the students,” said James. His brother Zach, one of the co-founders of L.A.-based content rights startup ZEFR, was once a student VC at UVF. He headed up the Provo arm of the student-run firm and helped hire and manage 10 other students during his time at UVF back in 2005. “I credit [UVF] for helping me get my first job out of college with Credit Suisse and for prepping me to have the knowledge to start my own company for sure,” Zach said. Fund principal Peter Harris has confirmed UVF is in the midst of raising a second round at $30-40 million from various banks and private equity investors. Some of the notable limited partners in the first round were VC Tim Draper, Wells Fargo and Morgan Stanley. But the fund also has some pretty deep ties to the Sorenson Capital investment fund and runs a joint program with the Sorenson Impact Foundation (operating under the University of Utah), which focuses on investing in social good. Harris hopes to close the second round of funding by the end of the quarter and says UVF is about to go through a bit of a rebranding effort. The new funding sets UVF up to possibly invest in bigger rounds. It also could give them the ability to possibly lead a few deals should they choose to go that route. Harris doesn’t want to comment on that for now. So far the strategy has been to let the students do the research and then add funds into rounds with bigger firms. Kallas and his colleagues tell me it’s not easy to get into UVF. There are only 16 students out of over 300 applicants currently in the program. Applicants go through a series of interviews with the other student associates and a rigorous application process. Kallas spent 45 hours on just his own application. Other students told me that was actually kind of low. “We want to know they are serious and we can rely on them. We are going to have to work with them so we want to make sure they are here for the right reasons,” said Kallas of the application process. Kallas encouraged his friend Benny Aune, the only woman currently in the program, to join him and his colleagues at UVF. “I really never thought of venture capital as a career until Kallas talked me into it,” said Aune. She originally came to Utah from Norway to be a pro ski racer. But an unrepairable tear to her ACL put Aune out of the game and she decided to focus on business school instead. UVF has helped her secure an offer from Goldman Sachs in London when she will graduate this spring. Aune says she is still considering her options. Students apply to go through UVF from all over the country. Longer-term students tend to come from the University of Utah, Brigham Young University and Westminster, which are all local. But the program accepts summer interns from Stanford, Wharton and many other top-tier schools. UVF has never led a round of funding. Instead, it focuses on letting the students do the background research and sourcing and then adding funds in partnership with bigger VC firms. 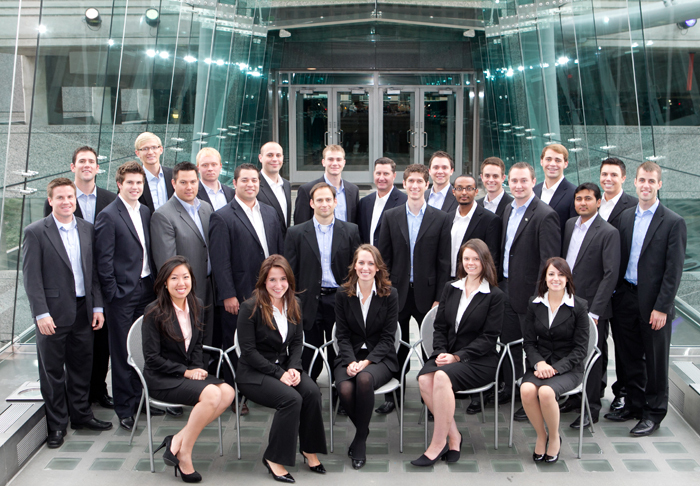 Students play a key role in helping these firms put together the deals. This has helped open up opportunities for them after graduation. The firm holds an annual VC conference called the University Private Equity Summit at the University of Utah each year. It pulls in top VCs and keynote speakers from across the country. Mitt Romney’s son Tagg came this year to represent his Boston-based VC firm Solamere Capital. Representatives from NEA, Sequoia, August Capital and Intel came out, as well. “Peter has a Rolodex a mile long and can introduce us to anyone we need,” said Kallas. He’s moving on to Battery Ventures as an analyst this summer and credits UVF for the introduction there. “That’s the great thing. Without an Ivy league education you can do that,” Kallas said about the strong network UVF provides for placement. Like Kallas and Zach James, most other students have gone on to top investment banks, private equity firms and other top venture capital firms after graduating. According to UVF, the program has a 100 percent placement rate so far.